How Much Can You Make in a Computer Programming Career? What Courses Can be Taken for an Online Computer Programming Degree? Computer programmers write in computer-specific languages to create software programs and other applications. For a computer program to work, a programmer must first design it, creating a high demand for workers in a variety of growing industries, and increasing the value of a computer programming degree. This guide covers several elements of online computer programming degrees, including curriculum plans, courses, and concentrations. Prospective students should also consider whether their potential schools hold accreditation, and what the career prospects and earning potentials are for computer programming graduates. This guide covers financial aid and scholarship options, to help you understand how to make your bachelor’s in computer programming more affordable. 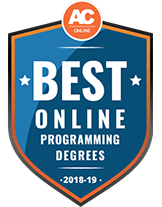 Below is a list of the best online computer programming degrees, which takes into account several factors including graduation rates, cost of tuition, and availability of online courses. When searching for a bachelor’s degree in computer programming, consider affordable programs that offer enough flexibility to fit your schedule. All data for this list comes from the National Center for Education Statistics (NCES). Students can specialize in applications development, business intelligence, cybersecurity or networking when enrolled in Bellevue University's online program to earn a Bachelor of Science in Computer Information Systems. You will satisfy 127 credits with a minimum 2.0 GPA by taking coursework through the web platform Cyber-Active. Resources such as BRUIN Support and the Service Desk are available to assist in academic advising or technical challenges. You need only fill out an application and submit proof of high school completion to be eligible for admissions. Davenport University's Global Campus supports online learners through free tutoring, military services, career guidance, library access, academic advising and technical assistance for navigating the web platform Blackboard. This option is available for many of the school's degree programs, including its Bachelor of Science in Computer Science for those interested in computer programming. The degree entails 120 credit hours with a 2.3 grade average. Students will complete both core and concentration-specific coursework in Artificial Intelligence, Gaming and Simulation or Computer Architecture and Algorithms. Your application must include transcripts and ACT or SAT scores. In addition to completing a bachelor's degree, students enrolled in WGU Nevada's online program for computer science will earn certifications in CIW Site Development Associate, ITIL 1 Foundation Certification, CompTIA Project+ and Oracle Database SQL. Curriculum is delivered in a competency-based format, allowing students to complete the required 120 credits at their own pace and take assessments when they feel prepared. All classes must be passed with a grade B or higher. You will submit transcripts, take a WGU Readiness Assessment and participate in an interview in order to register. The school encourages online learners to utilize their academic resources. Students interested in computer programming and who already hold an associate degree with a minimum 2.5 GPA are eligible to enroll in North Seattle College's Bachelor of Applied Science in Application Development. You will participate in 70 credit hours covering topics such as Relational Database Technology and Cloud Computing in order to fulfill a total of 180 hours. Curriculum is delivered through on-campus, online, practicum and internship experiences to prepare graduates for work as software and application developers. At Fort Hays State University, students working toward a Bachelor of Science in Computer Science will be prepared to enter programming positions in a range of industries and fields. Once admitted, you will complete 55 general education and 65 degree-specific credits with a grade D or above. Curriculum covers topics of data structures, programming language and software engineering. Online learners can utilize TigerTech, which helps you navigate your online courses or Tiger Outreach, which offers skill development for test anxiety, time management and self-care. Applying entails filling out an application and submitting transcripts. 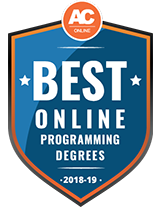 Students working toward a Bachelor of Science in Computer Science through Baker College's online campus can focus on computer programming, database technologies or mobile application software engineering. Program admissions call for the submission of transcripts, as well as SAT, ACT or GED scores. Once registered, you must complete a waiver acknowledging the requirements of the program and your responsibilities as a student. Degree completion will follow the satisfaction of 120 credits with a minimum 2.0 GPA. Free tutoring, a library database and writing services are just a few of the resources that online learners have access to. If you work for a partner corporation that participates in Limestone College's Corporate Grant Program, you are eligible for a 10% discount on tuition each semester. This deal applies to those studying online to complete a Bachelor of Science in Computer Science with an emphasis on programming. Following graduation, which involves the fulfillment of 123 credit hours with a 2.0 grade average, students enter the workforce as application developers, software analysts and software engineers. Applications should include transcripts and SAT or ACT scores. Students desiring to enter the workforce as computer programmers, web developers, network administrators or computer network architects can complete a Bachelor of Science in Computer Information Technology via online and on-campus studies at Hodges University. After finishing 120 credit hours with a minimum 2.0 GPA, graduation will lead to certifications in A+, Net+, Security+, Linux+, MCAS, CCNA, MCP, MCSA or ICCP C++. You must meet certain technical requirements, as well as sumbit transcripts, in order to be eligible for the program. Salary potential for computer programming graduates varies. A bachelor’s degree and prior work experience may qualify a programming graduate to work as an information technology (IT) manager. The U.S. Bureau of Labor Statistics (BLS) project positions for computer and information systems managers to grow by 12% between 2016 and 2026. Web developer opportunities should grow at double that rate, according to the BLS. A degree in computer programming does not guarantee any particular job or salary; however, employers in the computer science field often look for job candidates with bachelor’s degrees. Often called IT managers, these professionals take charge of all computer-related operations at a company. They evaluate their organizations’ technological needs and install the necessary hardware and software programs. Since IT managers run information technology systems, they must have advanced knowledge of computers and technology. Computer and information systems managers often need a few years of work experience, plus a bachelor’s degree in a computer science-related field. Computer systems analysts assess an organization’s IT systems and design programs to make those systems run more efficiently. These IT professionals sometimes create programming systems, and other times they oversee the installation of new IT programs. Computer systems analysts should hold bachelor’s degrees in computer programming, and understand business concepts. Software developers need computer programming skills to design computer software systems. These software systems allow computer users to easily operate IT. Software developers should understand the concepts of utility, design, efficiency, and functionality. Employers typically like to hire software developers with a bachelor’s degree and a strong background in coding and programming. Web developers write code specifically for the internet. They must know web programming languages like HTML and XML, and understand the concepts behind aesthetic design and utility for users. Front-end web developers focus on designing the overall look of websites. Back-end web developers create the basic structure of these websites. After obtaining a computer programming bachelor’s degree online, it’s time to find a job. Career opportunities vary greatly based on geographical locations, since certain areas may have a higher demand than others for computer programmers. Read on to learn about career opportunities for computer programmers in all 50 states. This section provides information about which states and cities pay computer programmers the highest salaries, plus job growth data across the country. Most computer programming courses include some element of coding or computer science, but no two programs are identical. In addition to required programming classes, colleges may require students to complete coursework in cloud computing or cybersecurity. Find below a sampling of common computer programming courses. This course prepares students to understand and utilize database application programming, like structure query language (SQL) and Python. Students learn how to clean and analyze data. They also study how to use data to create internet applications. No matter the programming language, all systems require users to have a solid grasp on algorithms. These algorithms help programmers create commands for data. In turn, these commands can help students find patterns in ones and zeros. Programmers know Java as a common and universally recognized computer language. This course teaches students how Java works, from sketching out an initial web interface to debugging the final product. Web programming courses exist at varying skill levels. Beginner courses teach students the basics of HTML. Students may also take more advanced coursework to learn about everything from cross-browser compatibility to server side language. C++ operates as a widely used programming language. Students enrolled in C++ courses learn about software design, data abstraction, and file processing within the C++ system. They study how C++ queries can create different IT systems. Students may invest years of their lives and thousands of dollars into their computer programming bachelor’s degrees online. For that reason, thoroughly research each prospective program before choosing the one that fits best. Take into account factors such as whether the program holds accreditation; whether the degree offers concentrations; and whether the program requires internships. You should also consider the cost of the program, the quality of its faculty members, and the school’s overall reputation. How should I decide which courses to take? First, look for the course catalogue. Schools typically post entire course catalogues online. The catalogue outlines program requirements for each degree, including which courses students must complete and how many credits they need to graduate. Students enroll in required courses, but they also choose from electives. Read over course descriptions in the catalogue to figure out which ones match your interests. Should I choose a concentration? This depends on your career goals. Before picking a concentration, consider which job you aspire to find after graduation. See if there is a specialize that would help you gain the skills you need for your dream job. If so, seek out programs with that specialization option. For instance, if you want to work as a web developer, then look for programs offering specializations in HTML coding or web development. Can I complete an internship while enrolled in an online program? Many schools allow, and some require, students enrolled in online programs to complete internships before they graduate. Unlike some traditional campus programs that partner with companies for internships, online students need to apply for these programs independently. Students must often do their own research to find out which local companies offer internship programs. Students may also find computer programming internships that allow them to work remotely. Will employers care that I completed my degree online instead of through a traditional on-campus program? Many employers, especially in the field of computer programming, do not consider whether job candidates received their degree on-campus or online. Instead, they care about the quality of the student’s education. They also pay attention to whether students graduated with an accredited degree. Accreditation evaluates whether a program teaches students the skills they need for a specific career. How long does it take to complete an online bachelor’s degree in computer programming? Online students can complete their degree on the traditional four-year timeline if they wish; however, online programs also allow students more flexibility in their schedules. Some programs offer accelerated degrees, which enable students to graduate in less than four years. Other schools let students study part-time to accommodate their extracurricular responsibilities. Part-time students may need five or six years to finish their degrees. Tuition expenses create a large financial obstacle for many students. Fortunately, schools, nonprofits, government organizations, and other groups provide financial aid to students who need help funding their education. The federal government also runs a low-interest loan program, which allows students to borrow money and pay it back after graduating. Students often prefer acquiring as much financial aid as possible through scholarships and grants, which do not need to be repaid. Created for women pursuing degrees in computer science or a related field at the undergraduate and master’s level, the Adobe Research Scholarship offers a $10,000 award each year. Winners also get a year-long Creative Cloud subscription membership, an Adobe research mentor, and a possible internship at Adobe. Applicants should submit three references, up to four essays, and an optional video describing their career aspirations. The deadline is early in the fall, and Adobe announces winners in late fall. Named for a card punch operator-turned-systems analyst, the Betty Stevens Frecknall Scholarship gives $2,000 to 2-3 winners each year. The Foundation for IT Education offers the scholarship. Applicants must have already declared a major relating to computer science. They should also be a full-time undergraduate student and hold a minimum 3.0 GPA. Betty Stevens Frecknall made a name for herself as a woman in a male-dominated industry, but the scholarship committee considers applications from both men and women. Each year, the Entertainment Software Association Foundation scholarship program distributes up to 30 awards, each amounting to $3,000. The ESA opens this scholarship to women and minorities studying a field related to computer science or video game arts. Candidates must maintain at least a 2.75 GPA in order to apply. High school seniors preparing to enroll in college receive 15 awards, while another 15 go to current college students. The Institute of Electrical and Electronics Engineers gives a student a scholarship worth $10,000 every year. The recipient may apply that total amount over the course of four years. Winners also receive a free student membership to the IEEE. Candidates should complete a project in computer science or electrical engineering as a part of their application process. The winner must present his or her project at the annual Intel International Science and Engineering Fair. High school seniors on the path to college may consider the Stokes Educational Scholarship. Sponsored by the National Security Agency, this award grants up to $30,000 to its recipients. Graduating seniors who apply must plan to pursue a degree in computer science or electrical engineering. Scholarship winners work at the NSA for 12 weeks each summer while enrolled in college. Applicants should have at least a 3.0 GPA.